My home recently featured in the August issue of NZ House & Garden, and I thought I would share some of the fantastic photographs taken by Jane Ussher. Our home is a constant work in progress and never quite finished. The perks (and sometimes the curse, if you ask my husband) of being an interior designer is that there's always a new furniture piece or fabric that you fall in love with. I also just like to experiment and change things continuously. If you follow us on Facebook you probably know how much we love built in dining bench seating. I commissioned Sunshine Joinery to build our one to mirror the window seat in our living room, with lift up lids for additional storage (you can never have enough). The squabs were made by the amazing Anna from Cushions Unlimited, topped with our own Bibby + Brady custom made throw cushions. Our American Oak dining table was beautifully built by Francois of Le Workshop. We designed the kitchen and Sunshine Joinery created it for us. My husband wanted a white kitchen, so I made sure it had lots of texture for interest's sake - beautiful tiles and panelled cabinetry. The twins were reluctant models, unlike Minnie that cat who followed the photographer around all day trying to get in every shot. The living areas in the house are all open plan so you can sit in the end living room and see right down to the kitchen. 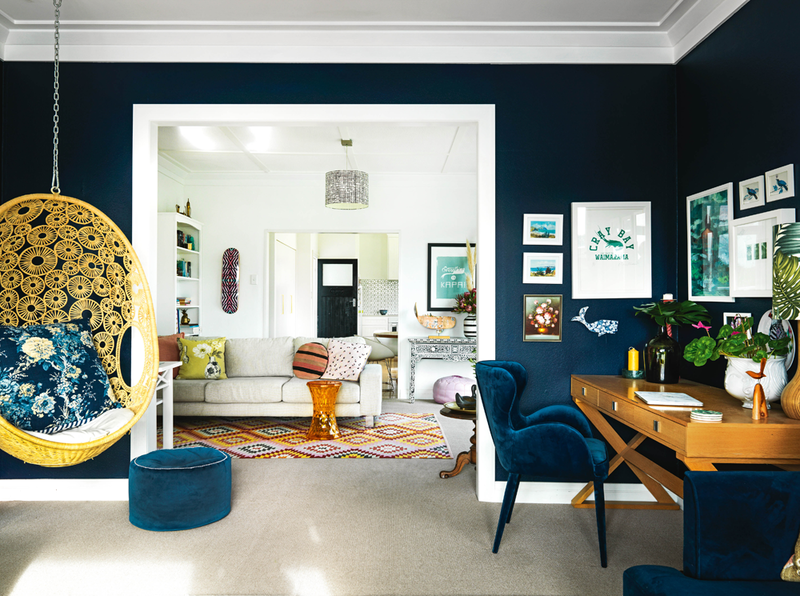 We recently painted this room dark blue (Resene Celestial Blue) to define it from the other areas and it's become my favourite space to be in. The middle living room has large bi-fold doors out onto our deck which fill the house with light. This is another favourite corner where I can curl up next to the open bi-folds with a glass of wine and a magazine. The chair is from our supplier Soren Liv (all of their furniture is available to purchase through Bibby + Brady), and the antique side table and vintage lithograph both belonged to my parents. The end living room overlooks the Botanical Gardens. The hanging pod chair is a popular reading spot, and the most comfortable chair you're ever likely to sit in! These are also available to purchase from Bibby + Brady. My desk is a happy place where I'm surrounded by favourite prints. A lot of our decor has a nature theme - water, birds and botanicals. This was never a conscious thing, but when you collect things you love you'll often see a pattern emerging. My grandmother's bridge table sits below a painting of my parents' next to the front door. My mother-n-law is always bringing us fresh floral arrangements, so this vignette is very close to my heart. 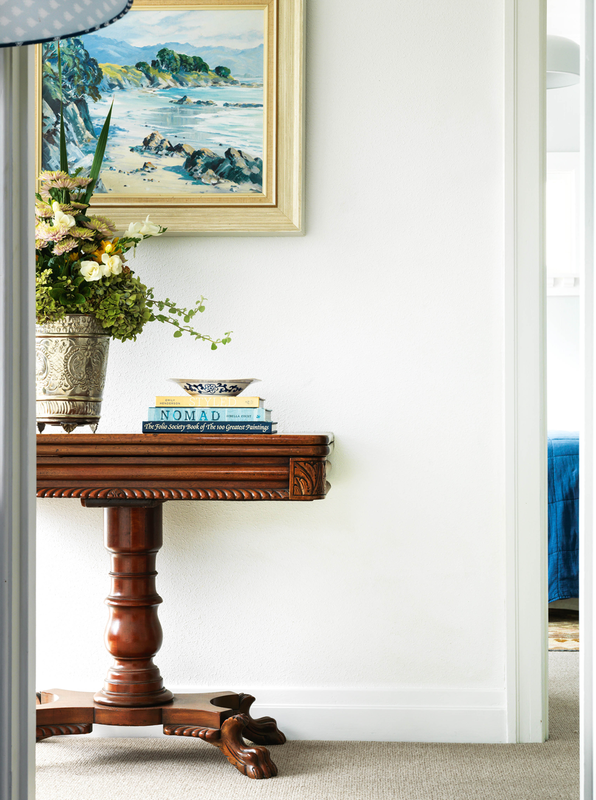 We love mixing old and new pieces in a home to create interest and a sense of history. 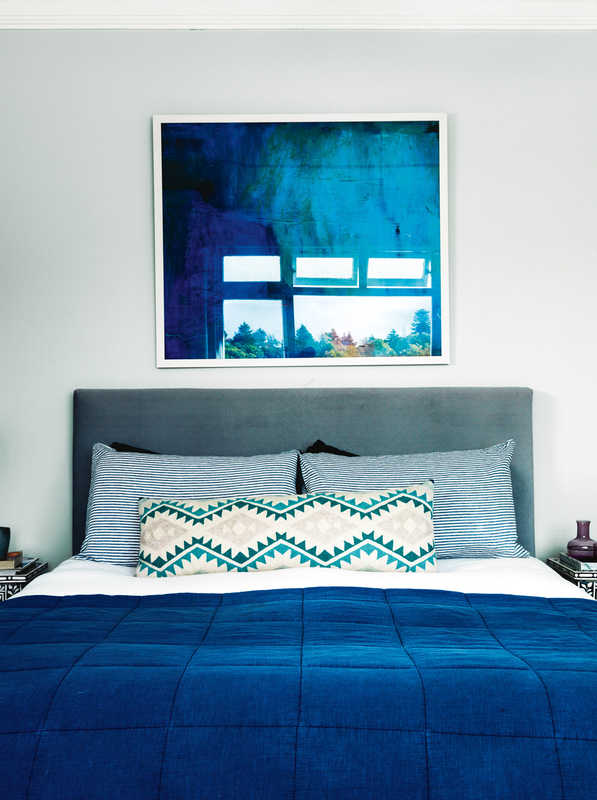 The print above our bed is by Australian artist, Andrew O'Brien. Our headboard was made by Little and Fox, but I've decided it's time to recover it. The soft grey velvet is lovely, but with so many amazing fabrics available to us in our job, it's hard not to be tempted by something new. With our kids growing up so fast, we're in the early stages of adding an extension onto our house. It includes a new master bedroom with walk-in wardrobe and ensuite, allowing our three girls to each have their own room. The kids' bedrooms will all be having a re-design at the same time, and they're looking forward to having input into the design of their own room. Make sure you pick up the October issue of NZ House & Garden as it features the gorgeous home of one of our client's - keep your eye out for the pink Smeg fridge.